Earlier this month, scientists caught a fleeting glimpse of a fast radio burst, or FRB, when their telescope just happened to be in the right place at the right time. 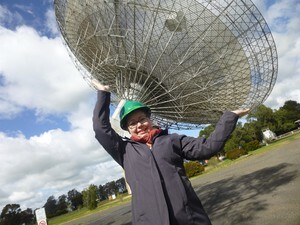 Swinburne University PhD student Emily Petroff was attributed with recording the first fast radio burst in real time. Based on this, researchers believe that up to 10,000 FRBs could be happening every day. Scientists don’t know exactly what causes them, which has led to some speculative media reports about extraterrestrial life, but Petroff said it’s much more likely that the bursts are either energetic flares from a star in another galaxy or two neutron stars colliding. Petroff attributes her team’s discovery of the live FRB to recording technology getting better and more sensitive. The group quickly got in touch with other researchers all over the world who had access to telescopes so they could hopefully document other FRBs. Petroff said that she went from managing a team of 15 at the university to 35 scientists all over the world, from India to the U.S. to Germany to Denmark.